New Zealand is getting serious about recognising its ubiquitous cultural and lifestyle influences from California over the 20th century. Auckland Art Gallery (Maori name Toi o Tãmaki) is presenting NZ's first substantial survey exhibition of California modern creative achievements. California Design, 1930-1965: Living in a Modern Way has been developed by experts from the Los Angeles County Museum of Art (LACMA) with Auckland Council gallery curators led by Ron Brownson. Including a rich series of talks, tours and other side events to engage both Kiwi connoisseurs and cultural tourists, it runs from 6 July to 29 September 2013. It is the Auckland Gallery's first international survey show to open since its new Director, Rhana Devenport, was appointed in May 2o13. Because Douglas Snelling is still relatively unknown in New Zealand's design and architecture communities – he only earned media publicity there as a magazine and radio commentator and cartoonist from 1936 to 1939 – his significance as an ANZ interpreter of California design innovations has not been noted. But the exhibition is vital for contemporary NZ students of design to understand how strongly US innovations stimulated the most progressive designers in New Zealand in the decades after World War II. 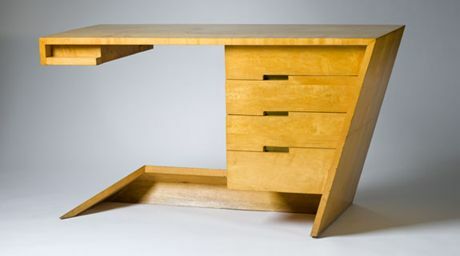 Maple and oak desk by LA designer Dan Johnson, 1947, from the California Design exhibition at the Auckland Art Gallery 2013. Photo Museum Associates/LACMA. 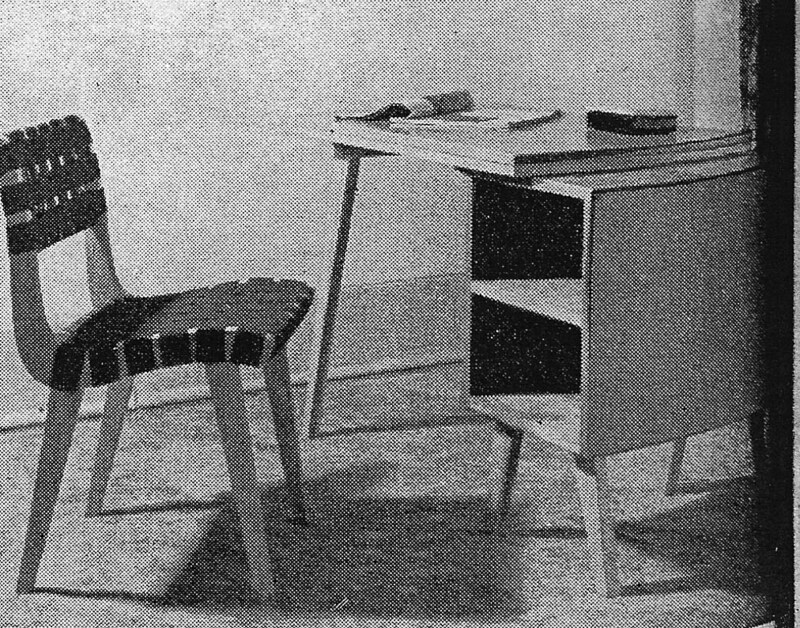 Late 1940s desk with 'California splay' legs by NZ-educated Sydney designer Douglas Snelling. Photo Functional Products 1949, probably by Ray Leighton. These two desks – one by LA designer Dan Johnson in 1947 and the other designed by NZ-educated Douglas Snelling in Sydney around 1948 – clarifies how closely antipodean designers were tracking and emulating the latest American west coast advances. With tight budgets, limited craft skills and scarce materials troubling designers in all countries after the Second World War, quality standards were often compromised. In this comparison, Johnson's desk required advanced carpentry skills (mitred corners and tricky saw-cutting on the drawer fronts) to make as a one-off, while Snelling's desk was designed to be assembled quickly in multiples by factory hands with minimal carpentry skills. Other links between Douglas Snelling and California are highlighted in other posts on this blog: his connections to LA architect Gordon Drake and Snelling's inclusion in a tribe of international designers who were 'California dreamers'.